Regular readers know this is one of my favorite subjects. I’m hearing way too much consensus thinking now to sit by without saying something. As our Explicit Investing Creed states; We are seeking Success over a reasonable Judgment Period by knowing when to embrace and reject conventional wisdom… We are approaching another one of those times. I’ll offer up just a couple items now and how you might accommodate when conditions change. Much of what we understand to be US public policy coming from the current administration stems from the fear of becoming a non-competitive nation in a fast changing global ecosystem. Like most developed countries, the US has been losing global market share of commerce for almost two decades. It’s a legitimate fear and not one that will reverse easily for many reasons. It doesn’t take much thinking to see how trade wars, tariffs and highly restrictive immigration policies fall under the banner of protectionism in an effort to Make America Great Again. The effort seems sincere as we rework trade agreements to be more US friendly, or add tariffs to imported goods (making our home grown goods relatively less expensive). And, we might even understand how tougher immigration might support the US labor force keeping wages high for legal work. But let’s look under the hood at a few unconventional realities, or unintended consequences. We are a global system now and have been for several decades.By removing ourselves from trade, renegotiating terms of trade, adding tariffs to imported goods, etc, we are making the false assumption that we don’t need to be part of the global system.We are pushing our little raft away from the busy port of global commerce and assuming that we’ll have everything we need on board. That is lunacy. The US is a very dependent country. We need cheap labor and cheap stuff to support our purely consumption based economy.And it all comes from outside of the country. Pick up any item at Wal-Mart and you’ll find it is Made in China. That’s how they keep prices so low… until now. When we push off and disconnect from our global partners, we also cut off foreign consumers for our own goods and we cut off our supply of lower cost labor. We must understand and know that all of this protectionism will “trickle down” in the form of higher costs of living for everyone here in the US. We do have the history books with plenty of examples to show that protectionism leads to inflation. The most obvious example today can be found among homebuilders where higher costs of materials (after tariffs) are making it tough to build affordable homes – among other things. 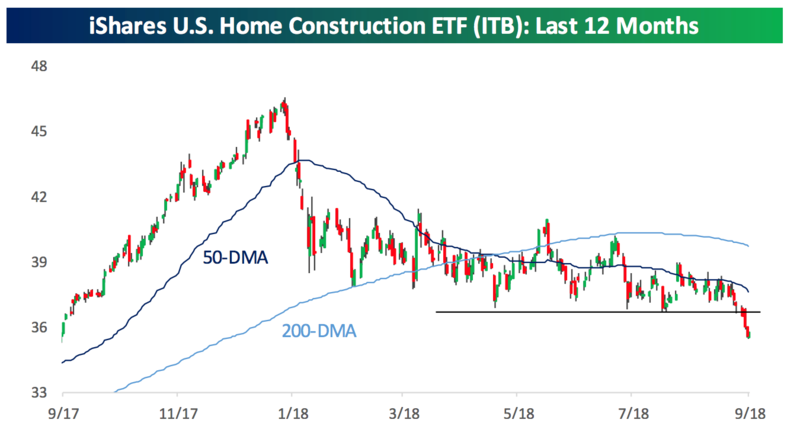 Take a look at the Home Builders ETF below. Other industries will follow as tariffs simply add costs to the end consumer. The first round of tariffs went after raw materials. Now the latest round is targeting finished goods. The end user will always pay the bill as the supply side of the equation just shrugs and passes on the cost. As long we are willing to pay more and more for the same thing, that trend will continue. Well, the obvious answers are found in your purchasing decisions. We should be working now to accommodate for a higher cost of living. If you’re buying a home, lean on existing inventory before building something new. Building costs are going to be much higher than you think and the finished price per square foot is likely already higher than current inventory. Lock in what you need now, rather than wait until later when prices will be higher. This especially applies to durable goods or things that you only purchase once every 7- 10 years (like a refrigerator, car, etc). Look for ways to reduce your monthly cost of living. That might mean eliminating any sort of consumer debt that carries high interest, getting on a bit of a budget for eating out, review your monthly credit card bill to discover all things that are dinging you on recurring charges. I’ll bet you find some stuff you don’t even use anymore. Call you wireless provider and ask if you’re paying the absolute minimum necessary based on your usage. If higher costs and inflation really take hold, we should also expect a somewhat abrupt change in the economic conditions in the US.Needless to say, our current environment doesn’t have much capacity for actual inflation. Passive index investing is just another trend and all trends end. Ben works in his own admission that behavioral economics tends to weigh in heavily at market extremes, both highs and lows. He says that asset allocation using passive indexes would be great if not for the realities of the human factor which drives us to sell at the lows and buy more and more at the top. Fear and greed, greed and fear. We are our own worst enemy when it comes to investing and that will probably be the only true constant in this business over time. The unconventional wisdom here is the understanding that passive index investing is just another temporal investing method that comes and goes, like many others. Today, we happen to be the very pinnacle of consensus opinion regarding indexing. It has become widely accepted as the only method that works. When the next bear market in stocks comes rolling through, that opinion will change quickly as it always does. In a more recent post Ben reminded everyone of the carnage in 2008 and 2009.Actually prices peaked in October of 2007 for the record. You might notice the very high correlation among index returns. All down hard. Only bonds put up positive numbers (+8%) but that wasn’t enough. Trend following systems like ours keep you out of these situations by actively moving out of indexes when the trend turns lower. Trend following systems are necessary to your financial survival. Conversely, passive systems rely on diversification across asset classes to preserve capital. It doesn’t work over a full cycle of bull and bear markets. Looking at the table above, I’m going to say that diversification would not have saved you in the last bear market beyond a little help from the bond market (not shown). I’m glad at least Ben has seen the light. So keep it real in here and recognize that passive indexing is just the trend of the day. If you don’t already have a system in place that monitors trends and makes changes accordingly, you need to do so right away. This applies to your 401k at work, your little sandbox account of stocks at E-Trade and any other pot of investment capital that is exposed to stocks. Note – 2018 is thus far an inversion year for stock price patterns. That means that it began weak (January – March) and has had an unusually strong middle (March – Sept). Again, conventional wisdom justifies all of this with strong earnings in the last couple quarters. But you must know that inversion years are very rare and usually show up in the final year of long bull runs. If the 4th quarter proves to be down, we should take note. 2000 and 2007 were both inversion years and both saw the markets down over 6% into the end of the year. Investech pointed this out recently showing how the markets are inverted with the normal mid-term election cycle pattern at this point in the year. Just a few things to chew on for this update. I have several more, but I’ve exhausted your attention span. Have a great week and know that we’re sticking with unconventional wisdom at this stage of the cycle.